In many of the tab management panes and in some of the dialog boxes within the Oracle VM Manager user interface there is an option to provide a Name Filter. For large deployments where many items pertaining to the current view may be listed, it can be difficult to find and select the objects that you want to run an action against. The Name Filter field is designed to make this process easier by allowing you to specify search criteria to filter the displayed results. In tab management panes, the Name Filter field is positioned just below the tabs alongside the Toolbar. 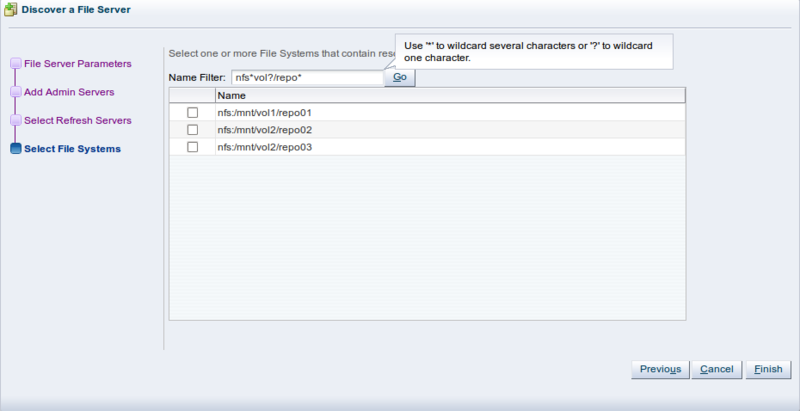 The input field is case-insensitive and accepts wildcard characters such as * (multiple character variations) and ? (single character variation). For example, a typical filter used in the Select File Systems dialog may look like this: nfs*vol?/repo*.